Although forest conservation activities, particularly in the tropics, offer significant potential for mitigating carbon (C) emissions, these types of activities have faced obstacles in the policy arena caused by the difficulty in determining key elements of the project cycle, particularly the baseline. A baseline for forest conservation has two main components: the projected land-use change and the corresponding carbon stocks in applicable pools in vegetation and soil, with land-use change being the most difficult to address analytically. In this paper we focus on developing and comparing three models, ranging from relatively simple extrapolations of past trends in land use based on simple drivers such as population growth to more complex extrapolations of past trends using spatially explicit models of land-use change driven by biophysical and socioeconomic factors. The three models used for making baseline projections of tropical deforestation at the regional scale are: the Forest Area Change (FAC) model, the Land Use and Carbon Sequestration (LUCS) model, and the Geographical Modeling (GEOMOD) model. 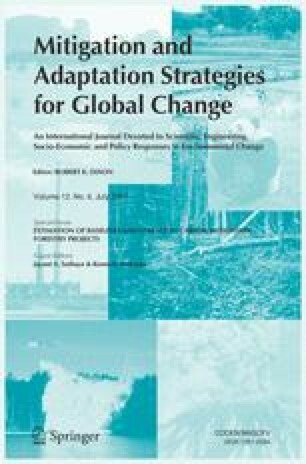 The models were used to project deforestation in six tropical regions that featured different ecological and socioeconomic conditions, population dynamics, and uses of the land: (1) northern Belize; (2) Santa Cruz State, Bolivia; (3) Paraná State, Brazil; (4) Campeche, Mexico; (5) Chiapas, Mexico; and (6) Michoacán, Mexico. A comparison of all model outputs across all six regions shows that each model produced quite different deforestation baselines. In general, the simplest FAC model, applied at the national administrative-unit scale, projected the highest amount of forest loss (four out of six regions) and the LUCS model the least amount of loss (four out of five regions). Based on simulations of GEOMOD, we found that readily observable physical and biological factors as well as distance to areas of past disturbance were each about twice as important as either sociological/demographic or economic/infrastructure factors (less observable) in explaining empirical land-use patterns. We propose from the lessons learned, a methodology comprised of three main steps and six tasks can be used to begin developing credible baselines. We also propose that the baselines be projected over a 10-year period because, although projections beyond 10 years are feasible, they are likely to be unrealistic for policy purposes. In the first step, an historic land-use change and deforestation estimate is made by determining the analytic domain (size of the region relative to the size of proposed project), obtaining historic data, analyzing candidate baseline drivers, and identifying three to four major drivers. In the second step, a baseline of where deforestation is likely to occur–a potential land-use change (PLUC) map—is produced using a spatial model such as GEOMOD that uses the key drivers from step one. Then rates of deforestation are projected over a 10-year baseline period based on one of the three models. Using the PLUC maps, projected rates of deforestation, and carbon stock estimates, baseline projections are developed that can be used for project GHG accounting and crediting purposes: The final step proposes that, at agreed interval (e.g., about 10 years), the baseline assumptions about baseline drivers be re-assessed. This step reviews the viability of the 10-year baseline in light of changes in one or more key baseline drivers (e.g., new roads, new communities, new protected area, etc.). The potential land-use change map and estimates of rates of deforestation could be re-done at the agreed interval, allowing the deforestation rates and changes in spatial drivers to be incorporated into a defense of the existing baseline, or the derivation of a new baseline projection. Funding for this work was provided by a Cooperative Agreement between Winrock International (WI) and the US Environmental Protection Agency (USEPA) (ID No. CR 827293-01-0 and XA-83052101; Sandra Brown, Principal Investigator and Ken Andrasko Project Officer) and by US Agency for International Development (Contract No. PCE-I-00-96-00002-00 Task Order 844, through the Environmental Policy and Institutional Strengthening Indefinite Quantity Contract [EPIQ] Consortium, and by Contract No. 523-C-00-02-00032-00). We thank David Antonioli for his support, guidance, valuable suggestions, and insights throughout the work supported by AID. We also thank David Shoch, Gil Pontius, Charlie Hall, Alejandro Flamenco, Heather Huppe, Miguel-Angel Castillo, Larry Gorenflo, Kim Batchelder, Billy Turner, Daniel Juhn, and Stephen Ambagis for their input.